Through an heirloom charm bracelet, three women will rediscover the importance of family and a passion for living as each charm changes their lives. On her birthday each year, Lolly’s mother gave her a charm, along with the advice that there is nothing more important than keeping family memories alive, and so Lolly’s charm bracelet would be a constant reminder of that love. Now seventy and starting to forget things, Lolly knows time is running out to reconnect with a daughter and granddaughter whose lives have become too busy for Lolly or her family stories. But when Arden, Lolly’s daughter, receives an unexpected phone call about her mother, she and granddaughter Lauren rush home. Over the course of their visit, Lolly reveals the story behind each charm on her bracelet, and one by one the family stories help Lolly, Arden, and Lauren reconnect in a way that brings each woman closer to finding joy, love, and faith. 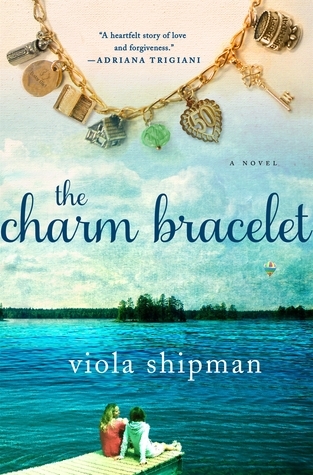 A compelling story of three women and a beautiful reminder of the preciousness of family, Viola Shipman's The Charm Bracelet is a keepsake you’ll cherish long after the final page. "The things I never told you, the questions you never asked .... it's time for me to share them. And the best way to do that is by telling you about these charms around my wrist." I have quite a fetish for charm bracelets, so was instantly attracted to this book. It tells the tale of three generations of women: a grandmother slowly losing her memory, but so full of wisdom; her daughter who never really lets her true self shine; and, the granddaughter trying to hard to please her mother at the expense of her own happiness. Each section of the book is themed by a particular charm and its inherent meaning. For example: Part Two - the dragonfly charm: to a life filled with good fortune. What would follow was usually a reflective tale that concerned how that charm developed significance to the person involved. "None of us every really dies as long as our stories are passed along to those we love." So to start with I was enthralled - this was right up my alley. However, as the book progressed and the thin plot remained so, my enthusiasm waned. I think it fair to say, that the pure focus here is a thin plotted story fashioned around charm bracelets and symbolism. Now whilst that in itself is a great concept, that alone does not hold a tale of fiction and drama. Each chapter could almost be viewed in isolation as you await for the deeper meaning and significance to be revealed of a particular charm.The life lessons and meanings are uplifting and make for reflective reading, for at its heart, its about sharing stories and passing them on. Yet by about three quarters way through, it became just a tad cliched as seeming situations conveniently arrived for another meaning to be conveyed. It was by no means subtle in delivering the contrived life lesson to be had. "That sounds like a bumper sticker." "I feel a story coming on." I did enjoy the book and would recommend it (as an aside I really enjoyed the descriptions of Lake Michigan). You do, however, need to be in the right frame of mind for warm fuzzies and swallow the sweet (at times sickly sweet) feel good passages. It is, above all, a tale about hope and how the past may impact upon the present and indeed the future. "These charms capture every moment of my life .... they tell the story of where we've been, how far we've come and where we still hope to go." This review is based on a complimentary copy from the publisher and provided through NetGalley in exchange for an honest review. The quoted material may have changed in the final release. Great review! Sounds a little syrupy for my taste.